Apple products aren’t typically prone to safety hazards, but one woman in Florida probably begs otherwise. 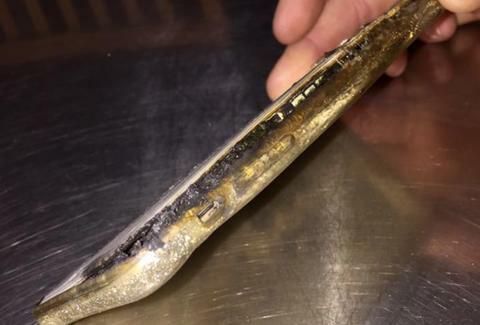 Amanda Bentz was sleeping next to her iPhone 6 Plus while it charged on a nightstand, until the device randomly erupted in flames, charring her pillowcase, comforter, drapes and a pair of earrings, reports CBS affiliate WTSP. “It woke me up,” she said. “The flames itself. There was no warning. It didn’t start sparking, smoking, nothing. Out of nowhere it just burst into flames.” Bentz’s husband, Kyle, took to Facebook to display the immolated phone. He warned others, that yes, it’s possible for your device to combust literally inches away from your scalp. Kyle, who put the fire out, claimed the charger wasn’t warm to the touch during the event, which he described as a “very awakening/sobering experience.” Apple is currently investigating the claim, per CBS, after Bentz reached out to the company. Although terrifying, Bentz’s story fits within a common thread of popular smartphones exploding at random over the course of 2016, and occasionally maiming people. Samsung’s Galaxy Note7 smartphone became notorious after a deluge of reports cited its tendency to ignite, often in extremely dangerous situations. The Korean company eventually recalled the device last fall -- a first for any prominent manufacturer of smartphones, and one that delivered a staggering financial blow. Apple has been party to its share of phone explosions in recent months, and not just in the United States. Customers in China reported multiple iPhone 6 and 6s explosions throughout the country late last year, while a few reports of Apple’s newest device, the iPhone 7, have indicated that it might also catch fire in certain instances. So sleep tight -- and at a safe distance from your phone.